Graduated from the School of Fine Arts, Department of Drama in Aristotle University of Thessaloniki. Her final year presentation was on “Ecological concern and the Cinema”. 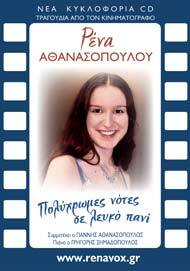 Her dissertation was the first complete study in Greek bibliography on the Greek Theatre broadcasted on the radio. 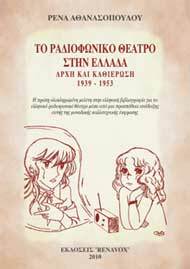 It was an attempt to shed light on this unique artistic expression and thus titled: Radio broadcasted Theatre in Greece: its beginning and heyday (1939-1943). Rena also studied theatre at Freie Universität in Berlin. Awarded with distinction the diploma in Opera / Lyrical Singing as Lyrical soprano, Rena is also an honours graduate of Armonia (higher theoretical studies in Music). Meanwhile, she took piano lessons during the period 1989-2003 and also attended lessons on Jazz singing and theory. Rena has also participated in seminars on acting in cinema together with the director Petro Sebastikoglou as well in the creation of films along with the director Mano Papadaki. She has also attended Masterclasses of various directors such as Kosta Gavra, Walter Salles and Jasmila Zbanic as well as the stage-designer Alex McDowell and the actress Lilli Taylor. Apart from her musical and theatrical studies, Rena has also attended masterclasses on Lyrical singing by Thomas Quasthoff in Berlin as well as a seminar on singing, piano and orchestra management by George Xantziniko. In Berlin, Rena also participated in a theatrical seminar on the play “America” by Franz Kafka. Rena is also interested in painting, photography and collage. She attended for a number of years painting lessons as well as lessons on comic’s creation and photography. She is also the head of the design and illustration of both her books and cds. Rena has also taken part in dancing lessons, kinesthetic and yoga. As for foreign languages, Rena attains a good level of knowledge in English (First Certificate of the Cambridge University). In addition, she has a very good level of proficiency in German (Mittelstufe and Grundstufe Certificate as well as studies of the German language, culture and politics in Freie Universität in Berlin). Since her childhood, Rena is involved in composition of songs as well as pieces of music. There is an archive of numerous materials of such kind that will be promoted disco-graphically in the future. Rena composes music for both Cinema and Theatre. The composition and musical performance for the German film ‘Die blaue Mauritius’ by Didi Hopf, as well as for the performance in the theatrical play ‘Storm’ by Shakespeare, are both some representative examples of Rena’s compositional skills. She also composed and performed the song ‘Journey towards the dream’ for the official opening of the 3rd Pan-Hellenic Conference of Amateur Astronomy. Since the age of six, Rena has been engaged in the composition of poems, songs and short stories and later on in the writing of theatrical plays and cinematic scripts. At some points in her schooling years, she has also been involved in journalism in various papers of Veria (Imerisia, Ionos). Finally, she has also been awarded for poetry at the “New Talents: Filona’ and in a competition of the European Association of Writers and Litterateurs. Rena has already performed this year, in various cities in Greece, a number of live performances with cinematic songs, a part of which was presented in the 3rd International short-films festival in Naousa, Greece. Moreover, she has performed songs in recitals of classical repertoire such as arias of ‘Tosca’ from Puccini’s opera, ‘Pamina’ from the ‘Magical flute’ by Mozart, ‘Rusalka’ by Dvorak. In addition, Rena has participated in various musical and musical/theatrical performances. As for the theatre, and during her bachelor studies, Rena directed and played the Jewish in ‘The Jewish Wife’ by Bertolt Brecht. In ‘Victor or the children in power’ by Rose Vitrac, she directed and played Inta and Esthir; in ‘Business dinner’ by Sean Slater, Rena directed and played the role of the entrepreneur. At the same tie with all her above interests, Rena has been also engaged in Amateur Astronomy as a member of the Friend’s society of Astronomy in Thessaloniki and the Association of Astronomy and Space in Volos, Greece. 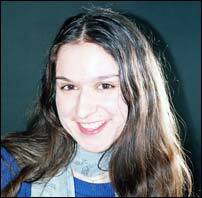 She has been a conventioneer in the 1st and 3rd Pan-Hellenic Convention of Amateur Astronomy. It is worth mentioning that in the 3rd Convention, Rena presented a lecture on the first film with an astronomical topic, ‘The Journey to the Moon’ by George Melies. Rena has been a theatrical teacher and syllabus coordinator in cultural and leisure camps for children as well as in Y.M.C.A. of Thessaloniki. The past years, she has also been a private music tutor in both children and adults. The love for Ecology and Humanism as well as the actual involvement with them, is what defines Rena’s perception and way of living to a great extent. She is the founder of the Ecological youth action team, ‘Dolphin’, with many actions in its record and cooperation with various ecological and humanistic groups. Rena has been a supporter and member of numerous relevant organisation, such as WWF, GREEPEACE, Arcturos, MOM, Medecins Sans Frontieres, UNICEF etc.